I am not going to stand back while people’s aspirations to get on the housing ladder, to own their own flat, to own their own home, are being trashed. With this, the government launched the second part of its Help to Buy scheme, its latest solution to the housing problem. Without doubt there’s a big problem to solve. The housing shortage that has been building up over the past 30 years is reaching the point of crisis. Homelessness is on the increase and has been for three consecutive years1. At least 50% of those affected are women and children and according to Shelter some 80,000 children are classified as homeless. The shortage of affordable housing and cuts to benefits play a major part, but 27% of households accepted as homeless between April and June lost their home when their private landlord simply decided to stop renting to them2. In fact the loss of a private tenancy is a growing cause of homelessness and has been since late 2011, with the proportion of households citing the loss of private tenancy as the trigger for their longer-term homelessness at an unprecedented high. In London this is having a visible effect; the number of people living on the capital’s streets has risen fast in the last three years and is now 13% higher than last year. For those renters still with a roof over their heads, the costs of keeping it are rising. The average monthly rent in the UK is currently £743 but in London rents are typically £1,126 and rising at a much faster rate than inflation, up by 4.8% year on year. Official figures released in January showed that house prices in London are also up by nearly 10% year on year, indicating the strength of demand for homes in the capital. Overcrowding is rife with 11.6% of the capital’s dwellings having too few bedrooms for their occupants. And like the rest of the country, more of its working households are on the bread line facing food and fuel poverty which are at shocking levels. In all, some 13 million people in the UK can’t make ends meet. Private rents have increased by 37% in the past five years and are forecast to rise by a further 35% over the next six years3. According to a recent report by Shelter, one in five of us borrow to meet rent or mortgage payments. Over one million people had borrowed from high-cost payday loan companies to fund their housing costs last year4. And the dream of home ownership for many is just that; a distant dream. For years Greater London has been failing to generate the numbers of new homes it needs. London councils have recently calculated that to clear the backlog and meet growing demand more than 100,000 new homes a year will have to be built until 2021 some 809,000 in all, and this numerical shortfall is accompanied by the ever growing problem of affordability. House prices in London are now soaring above where they were before the crash, making homeownership beyond the reach of ever more people. The days when an average Londoner could buy a first modest home in a run-down part of town disappeared more than 20 years ago. Now most people in London just stretch to pay their high rents which inevitably means they can’t save up for a deposit. Someone working full time on the minimum wage won’t earn enough for an affordable room in the average shared flat in any borough of London let alone an average first-time buyers deposit of £64,0005. As a result the percentage of homeowners in the capital has plunged from nearly 60% to under 50%, reversing an upward trend since the 1960s. This is a bitter blow to the notion of the “property-owning democracy” touted first by Tories then Labour, which is why Help to Buy was dreamed up. The scheme started in 2012 in response to the low take up of new mortgages. Under the plan, banks and building societies are encouraged to lend up to £130 billion to potential buyers seeking 95% loans. Some £12 billion of taxpayers’ money has been earmarked to insure deposits of up to 15% on properties worth £600,000. Supporters of the scheme see it as win-win; desperately needed new homes are created (even if they are the smallest in Europe, and often part of an ill-designed and ill-equipped urban sprawl eating up all available green space). At the same time desperately needed jobs are created. The main beneficiaries, (apart from the big construction firms who have been given a windfall from the state) have been private landlords who have been snapping up properties to rent. Alongside the usual eagle-eyed developers are a new breed of existing well-off homeowners who are buying up in such force it’s leading to a new phenomenon known as ‘let to buy,’ i.e. homeowners keep properties for profit then release cash from them to subsidise a new home for themselves. There has been 13% increase in let-to-buy properties compared with last year, according to broker John Charcoal. The Royal Institution of Chartered Surveyors (RICS) claims that the number of surveyors reporting house price rises has surged to an 11-year high. As the government pours money into Help to Buy and subsidises the well-off middle class, at the other end of the spectrum we have the continuation of the bedroom tax. It was introduced to free up larger familiy sized properties in the social housing sector, a growing necessity especially in London where demand for social housing is at a premium. Basically anybody on a low income and/or receiving benefits, living in a property rented from either the council or a housing association with a spare bedroom, faces a cut in Housing Benefit of 14% for one extra bedroom and 25% for two or more bedrooms. Billed as a ‘fair system’ to stop under occupation, the bedroom tax has caused misery to thousands of the poorest families in the country. Many who want to move find there aren’t enough smaller properties, especially in the North and councils are struggling to cope with the demand. Others, with young children under ten whose homes are fully occupied, have been shocked to discover that their child only counts as half, making them also liable to pay. Those who have been forced to move have faced massive disruption to work and family life with children having to change schools etc. The confidence of the government in carrying out such a stark class attack was further cemented in September 2013 when a United Nations’ special investigator, Raquel Rolnik, issued a report denouncing the bedroom tax as shocking and against human rights, calling for it to be abolished immediately. Grant Shapps, Tory Party Chairman, denounced Rolnik’s report as ‘a disgrace.’ Not even the disgust of other factions of the ruling class has had any impact. 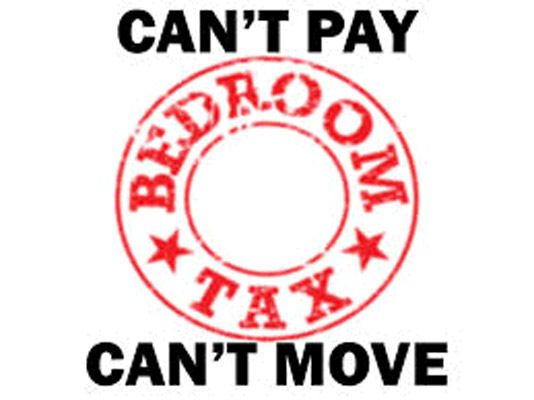 Both the bedroom tax and the Help to Buy scheme could be written off as at best ill-conceived and at worst as knowingly divisive, but both pale in comparison at the mess left by the housing policy which has dominated for the past 30 years, namely the Right to Buy. The great Council house sell-off started with the onset of the capitalist crisis in 1973 but was pushed in earnest from 1979. Designed to make us a nation of homeowners, was Britain’s biggest privatisation (worth £40 billion in its first 25 years). It was also part of the unravelling of the post war settlement which had offered decent housing for the working class. Of all the spending cuts made by the Thatcher government in its first term, three quarters came from the housing budget. The government not only sold council housing at a huge discount, it allowed the original buyers to keep the profit when they sold those on to a private landlord at market price. However, councils were not allowed to spend the money replacing the homes they sold, and central government funding for housing was slashed. And by stopping the councils rebuilding their stock, it created a huge demand, artificially raising market rents by choking off supply. It then paid those artificially high rents to the same private landlords in the form of housing benefit, many times higher than the housing benefit it would have paid had the houses remained as council stock. And so the right to buy created a leak of money into the hands of a rentier class. With cheap “buy to let” mortgages, everyone with money was encouraged to become a private landlord. The result has been a housing shortage with consequent staggeringly inflated rents. A recent report8 by Labour London Assembly member Tom Copley, found that since the introduction of right-to-buy, more than 271,438 council homes have been lost from the council housing stock in London alone. In the decade between 2001 and 2011, the proportion of privately rented households with dependent children increased from 19% to 29%. Those living in privately rented accommodation claim as much as £100 a week – £520,000 a year – more in housing benefit than council tenants in the same area. Tower Hamlets, where four in 10 children live in poverty, has the highest proportion of homes that were sold through “right-to-buy” but are now believed to be privately let. Here a tenant in a council house will pay an average of £121 a week, compared with £212 a week paid by someone in a private rented property. The report states that’s the right to buy is “possibly unrivalled” in providing poor value for money for taxpayers and local authorities, not to mention for the tenants themselves. Not only did taxpayers fund the initial building of the council homes, they subsidised the substantial discounts offered to tenants and then – once the homes were sold – missed out on the rental income that would have covered the build costs. To add insult to injury, the evidence uncovered highlights that at least 36% of all homes sold by councils across London are now let by private landlords. Rents have gone north, and benefit levels south. The gap is such that I have taken the decision to withdraw from taking tenants on _housing benefit. From what I can gather just about all other landlords have done the same. Our situation is that not one of our working tenants is in arrears – all those in arrears are on housing benefit_. This new breed are making Rachman look like a soft touch10. This government may be blatant in its class bias when it comes to housing, but Labour has an equally appalling record. Less social housing was built in the 13 years of the last Labour government than under the Conservative one which preceded it and in practice its policies followed the same ideology that housing is not a basic human right, but something to make a profit from. As a result every government’s housing policy since Thatcher has treated housing as a prime investment which has resulted in this growing crisis. But the last four decades of housing policies are more than merely short-sighted and ill-conceived. They are proof that capitalism is utterly incapable of meeting a very basic need. Its only solution is to increasingly marginalise and demonise those at the bottom of the property owning pile, increasingly coming up with policies that only exacerbate the problem, causing more misery for the poorest and the more vulnerable while lining the pockets of the super-rich. If any proof were needed of capitalisms toxic incompatibility with the basic needs of humanity, then look no further than the housing question. Under a saner system which for the sake of brevity we would call communism a first step would be to guarantee the right to residence in perpetuity to all tenants and mortgage payers for nothing. As a corollary all surplus accommodation (second homes, empty offices capable of conversion, etc)would be sequestered to house the homeless. Over a longer period we could begin to plan real communities for real people to choose how and with whom they wanted to live. However, solving the basic question comes first and it is not difficult to tackle if housing is seen as a need and not about “property”. 1 This is official homelessness as defined as street homelessness or people living in emergency accommodation. It does not include hidden homelessness or overcrowding. 3 According to Mayor Boris Johnson, your rent is affordable if it doesn’t take up more than 35% of your take-home pay. For example, the average household in London aims at an estimated £2,608 per month after tax, so an affordable rent for them to be anything up to £913 per calendar month. 4 Shelter Report 15 January 2014. The charity said it had helped 8,995 people with payment or arrears difficulties over the last 12 months compared with 6,797 the year previously. It warned that for every family it had helped, more would be keeping their difficulties hidden. The survey found that 25% would feel too ashamed to ask for help when struggling to pay. 5 From data released in August 2013 by the Council of Mortgage Lenders quoted in the Daily Telegraph 28 August 2013. 6 Duncan Scott quoted in the Independent 29 September 2013. 7 In May 2013 Stephanie Bottrill, a 53-year-old woman with an auto immune system deficiency, left her home, headed for the M6 motorway, and walked out in front of a lorry. Days before her death, she had told neighbours, *“*I can’t afford to live anymore”. She had wanted to downsize her home in Solihull West Midlands, but the council had nothing smaller available. After being told she would need to find £80 a week to make up the shortfall, the stress of having to find extra money to stay in her home became too much so she took her own life. 8 From Right to Buy to Buy to Let. Copley compiled the report from responses to freedom of information requests made to councils. The report was published in January 2014. 9 Copley’s report concludes with a call for mandatory covenants on all right-to-buy properties so they cannot be let through the private sector. It says a new system should be introduced whereby local authorities retain an equity stake in any property sold. However the notion of stable doors and horses comes to mind, with this particular horse having bolted sometime in the 1980s. 10 Peter Rachman was a notorious property tycoon in London in the 1950’s and ‘60’s, but many of his worst excesses, such as getting rid of sitting tenants and replacing them mostly with immigrants who were then exploited and charged much higher rents, is not too dissimilar to Wilson’s plan to replace single mothers on benefit with Eastern European migrants, who, he claims, default much less frequently than single mothers on welfare. As he puts it: “Tenants on benefits are competing with eastern Europeans who came to the UK in 2005 and have built up a good enough credit record to rent privately. We’ve found them to be a good category of tenant who don’t default on the rent. With tenants on benefits the number of defaulters outnumbers the ones who pay on time…Single mothers on benefits have been displaced to the bottom of the pile; sympathy for this group is disappearing. There aren’t enough places for people to live.” According to the Guardian there is another reason pushing landlords to evict: “A key factor for Wilson and other landlords is that it is impossible to obtain rent guarantee insurance for a tenant on housing benefit. This type of insurance is sold to landlords and is designed to cover the rent if the tenant stops paying for any reason.” (Guardian, 4th January 2014).